FOR THOSE WHO MISSED IT: In the summer of 2011, French music artist and YouTube sensation ARNAUD QUERCY became a contributor to the project. 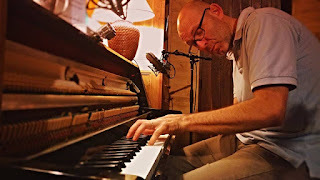 Arnaud wrote a fresh, new arrangement of the love song, "All My Life" with the intention of the project in mind, and interprets his arrangement through his heart. He is a native of France but he lives and records in London. Arnaud has become an international sensation through his own special Arnaud Quercy Jazz Project shared on YouTube that has attracted a large following; it is based on a dare from a colleague at a Christmas party to become proficient at playing jazz piano. The Piano Jazz Project began in January 2010 and at that time had close to over 171,790 viewers and over 2,230 supportive comments! I discovered Arnaud's special Piano Jazz based on YouTube after discovering it on Facebook in one of the music groups, and asked if he would accept my commissioning him to arrange a version as a gift to the Reach 4 Freedom Project. Immediately, he accepted! Arnaud uploaded "All My Life" as part of his piano jazz project on Wednesday, June 22, 2011. His video of the song received over 9,000 views (plays), over 320 "likes" and over 350 positive comments at that time. "All My Life" is the first song I dedicated to the Reach 4 Freedom: Heal Child Abuse Music Project. Every time this song is played, produced, arranged, recorded, shared by ANYONE -- all the energy generated by ALL activity with this song is dedicated to solutions for child abuse in the world. Arnaud, many thanks for your gracious gift to this project. Your version is c'est ci bon! May you continue to have the success you desire to claim and share! UPDATE: I am happy to have heard from Arnaud that he and his family are safe, and were not injured during the recent terrorist attack in Paris. Thank God!